Picture a roof in your mind and you’ll likely think of a straight, sloping surface — probably with dark slate or asphalt shingles. After all, that’s exactly what you see on house after house when driving through almost any residential area in America — homes with straight, sloping roofs. But this wasn’t always the case. The roof is a major component of any home, and for a long time, it was a place where functional and aesthetic purposes figured equally into its design. Curved roofing dates to another time — an era when getting a house completed on time and under budget wasn’t the only consideration. A curved wood roof from Custom Shingles takes this artisanal tradition into the 21st century. Just as homebuilders from yesteryear placed an emphasis on creating something beautiful, unique and lasting, we breathe new life into this antique approach to roofing. 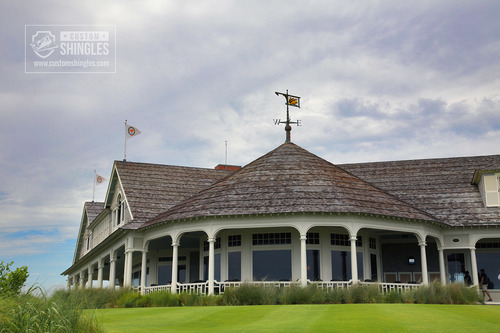 Curved roofs break the rules of standard tee-square construction, making a bold statement with radiused lines that reach into the past while symbolizing forward progress. The result of curved roof shingles after installation is nothing short of dramatic. No longer does your roof blend in with all the others in your neighborhood. Curved roofs help your entire home reach its peak attractiveness, making it more interesting to look at and boosting its curb appeal. Not just any roofing service provider can handle and install curved roof shingles — the procedure requires specially crafted shingles and the expertise of skilled architects and craftsmen. Custom Shingles is one of the few companies today producing made-to-order curved wood shingles and shakes, using our patented steam-bending system. We can install, repair, replace or restore a curved roof on practically any property. Keep reading to learn more about your options, or contact a representative for assistance. The manufacturing of curved wood shingles require experience, knowledge, care and attention to detail — assets that only select roofing manufacturers or installation professionals can provide. At Custom Shingles, we’ve spent decades perfecting our approach to both the creation and installation of curved roof shingles, which puts us far above others who offer these services. To create our curved roof shingles, we employ a steam-bending process that gently softens and shapes the wood without compromising its structural integrity. This is highly important when it comes to creating the perfect blend of beauty and long-term durability and performance. This approach is rare because it’s incredibly hard to execute and requires special effort. Though time-consuming, the process ensures a product that is carefully fitted to the design specifications of your roof. Precision is of the utmost importance, which is why attention to detail is our priority throughout the process. Further customization is available through our lineup of Fancy-Cutt™ profile shapes, and range of wood and color finishing options. 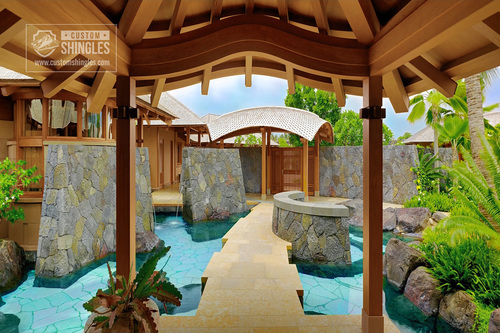 Check out our blog to see some of the many curved roof projects we’ve completed for demanding customers around the world, including the spectacular luxury villas we designed for a resort in Thailand. If you’re unsure if curved roofing is right for you, just wait until you discover the powerful images of curved wood shingles in action. Yes, curved roofing is just about the most unique and attractive type of roofing you can choose for your home, but it offers far more than just beauty. The wood suitable for curved roofing is often incredibly durable, too, including natural resistance and durability you won’t find with more traditional roofing materials. Several different types of wood can be used to create curved roof shingles. The right choice for your project will depend on a combination of your location, climate and budget. Cedar is a popular choice, as it is economical, attractive and, if treated properly, long-lasting. At Custom Shingles, we can provide expert guidance on what type of wood will work best at your home based on your unique circumstances. Teak is an excellent upgrade for long-term durability, and one that could be considered a “lifetime” product. It has been used for centuries in boat-building, and has superior resistance to rot and moisture. It also has a low shrinkage ratio, which makes it perfect for use in areas where temperatures shift frequently. Teak is an exotic roofing solution that provides unmatched attractiveness, as well as durability and resistance to elements you’ll appreciate. We also offer curved shingles and shakes made of Royalwood™ Wallaba, a South American hardwood with a rich red color, light weight and exceptional durability. All our curved wood shingles are cut to order and can be customized to meet the requirements of your build. Let our team help you choose the best material for your project and create the curved roof of your dreams. The manufacture of curved wood shingles is an incredibly intensive process that demands care, attention to detail, experience and knowledge. The installation of curved roof shingles requires the same. We’re proud to say you’ll find the skills and dedication needed for proper curved roofing installation at Custom Shingles. Your home and its roof are too valuable to entrust to just any service provider. Make sure you're getting the best products and installation services out there by choosing Custom Shingles. Contact us today to request a quote on curved roofing.